Scottish Jew wants to take up Golf ! 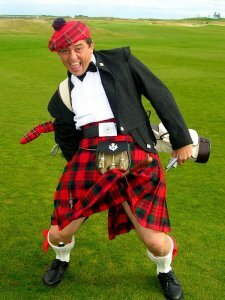 A Scottish Jew decided to retire and take up golf, so he applied for membership at a local golf club. in the steam room with you, since your privates are different from theirs. Scot: Ach, I know that you have to be a Protestant to march with the Orangemen. And I know that you have to be a Catholic to join the Knights of Columbus . But this is the first time I've heard that you have to be a complete prick to join a golf club!